After an eventful first 2 weeks being in China I've already learned so much. 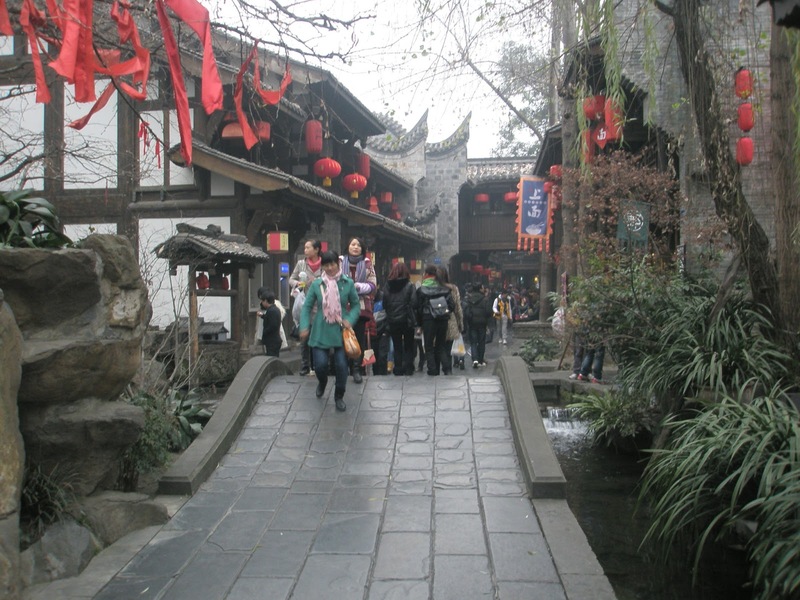 Experiencing the differences between American and Chinese societies and lifestyles has been the most interesting part. It's been such an incredible trip so far and we are only halfway through! 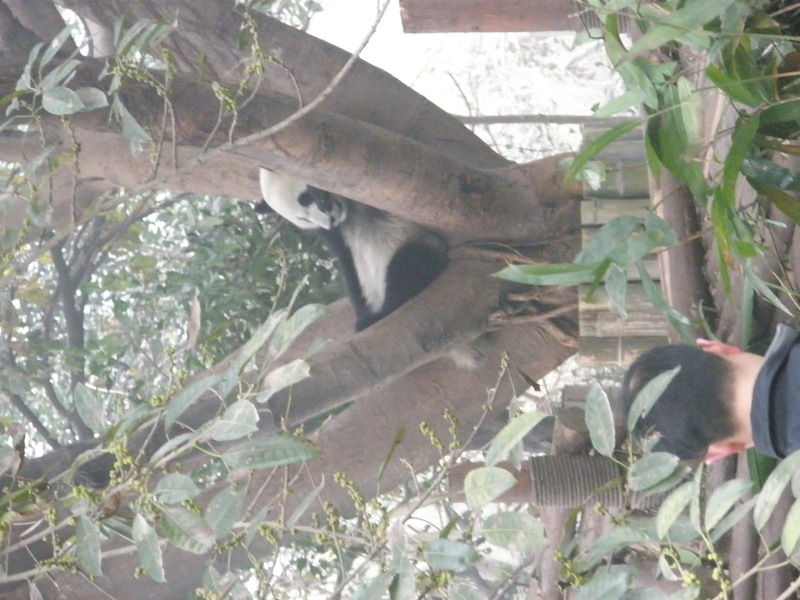 We started off this week with something that everyone was looking forward to: the Chengdu Panda Research Center! 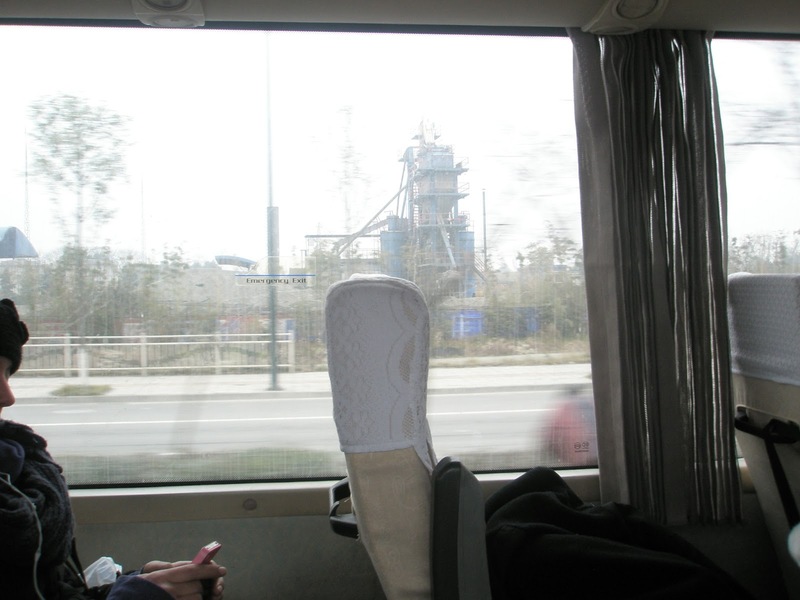 As we drove away from the city, we were able to get a little bit of rest before we arrived at the center. 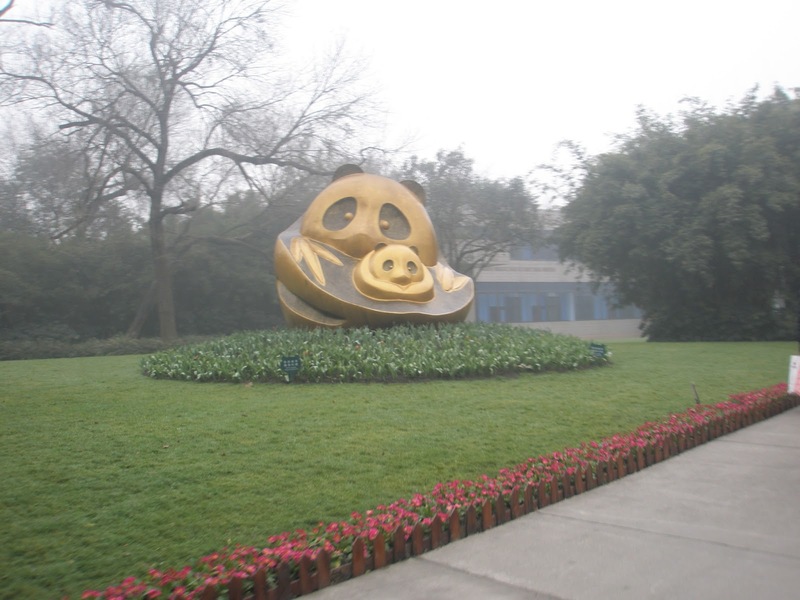 Still, it was apparent after the first half hour that there was a significant difference between the city of Chengdu and the more rural areas. After passing construction areas and broken down buildings for several minutes we ended passing endless fields of crops and dirt that seemed a little desolate, which makes sense with the seasonal weather. As we passed through the ever-present smog, we finally, reached the facility and got an idea of just how large the center was. It felt more like a zoo than a research facility! While areas of the place were under construction, we everyone was bright-eyed at the forests of bamboo planted specifically for the facility. Through the front gates and we were already seeing one of the buildings that held a museum and gift shop full of panda dolls, hats, sweaters, and other knick-knacks. We hopped on little trolleys that took us through the giant sanctuary to where the main pandas were held. The ride felt somewhat like the beginning of Jurassic Park, without all of the deadly dinosaurs. 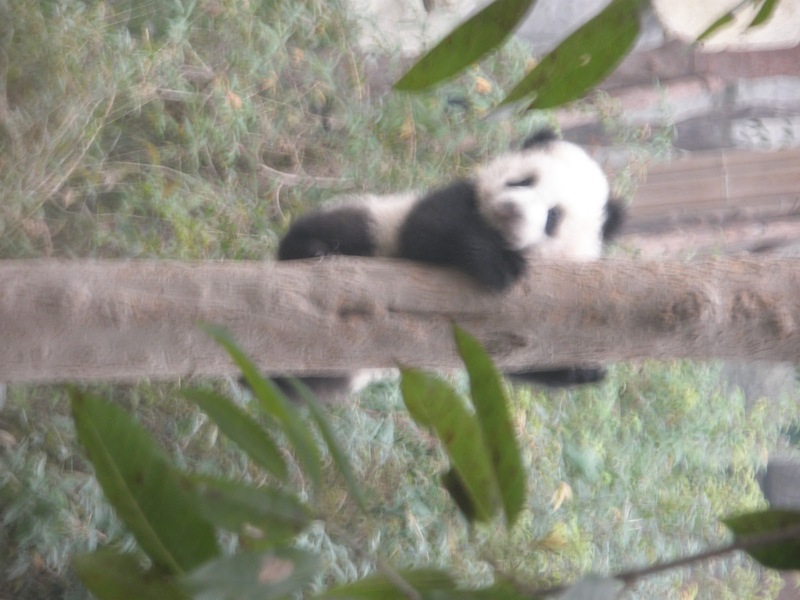 Once we arrived at the end of the ride, we were able to already see several pandas in their own ideal environments, that catered to all the needs of the pandas, including food, shelter, trees to climb, water to drink and caretakers to help them bathe and to play with them. The first one we saw was actually getting washed by one of the caretakers and right after putting the cub down, it walked over to a nearby tree and began to climb it! Everyone, myself included got our cameras out as fast as we could and snapped several pictures of the little guy. After a minute or so, he climbed back down and went off to get a drink in his little watering hole. As we moved on we spotted several adult pandas in a slightly larger area, all of which seemed to be living up to their reputations for being the laziest kind of bear. They were scattered, some laying on large decks made of large bamboo rickets, while others were up balancing in the trees. From here, we were able to see a small indoor facility with cages, play pens, and incubators for baby pandas to be handled by professional veterinarians that work specifically with pandas. Sadly, we didn't see any newborns while we were there, since they more often breed during the early spring and give birth in the late summer and early fall. From here, we went down towards another area of the park, where a small indoor theater showed a short documentary of panda lifestyle, eating habits, breeding and birthing has evolved over the last few millennia and discussed how the Chengdu research center came about and how well it treats the incoming pandas and what breakthroughs they've made over the last several years, especially in the process of breeding and artificial breeding of the pandas to continue their existence and save them from extinction. 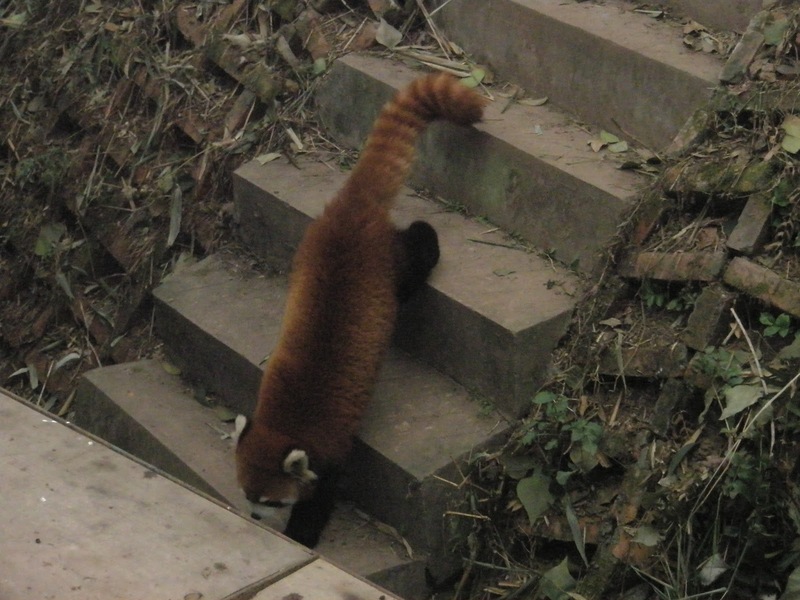 After the short film, we wander through to the other main group of animals, also called the "red pandas" due to their red fur, though they look more like a raccoon than a panda bear. Technically, they aren't even in the same taxonomic family as the panda! After we wander a bit more and saw the small lake that held several colorful Gobi fish and black swans, we were able to have a quick lunch at the bamboo-themed restaurant within the center. Even some of the food we bought had parts of the bamboo plants that pandas ate, in order to feel more authentic. Overall, the food and experience was fun and memorable. Sadly, due to the degree in panda populations and dwindling amounts of funding they were getting from the government, the facility was charging people 2400 yuan, equal to roughly 400 American dollars to be ale to get their picture taken while holding a young panda cub, which none of the students could afford. After we left the research center, with souvenirs and gifts bought and packed in our bags, we headed on our way back to Chengdu, but not before taking a quick stop at one of the local markets for some sight-seeing and bartering. After a few hours we headed back to our hotel and relaxed for the night. The next morning, we started off class bright and early, with lectures about the etiology and pathology of diseases within the bounds of Traditional Chinese Medicine. This discussed some very vague factors, such as "Wind, Summer-Heat, Dampness, Cold, Dryness, and Fire." While these seem like just words to us, rather than actual pathogens that could causes disease, many people within the population believe in the theories of TCM. It was also discussed that internal injury can occur from the overwhelming of specific emotions, such as joy, sadness, grief, or fright. After learning these concepts, we began learning about acupuncture and its entire theory. While it was difficult understanding our interpreter who was speaking for the teacher, the stuff that we were learning about acupoints and moxibustion was extremely interesting and very complex. It is easy to say we all left class a bit frazzled from that lecture. We decided it would be best to get some food that reminded us of home. So after a few blocks of walking we found the supermarket and a local McDonald's and scarfed down on some burgers and fries! I have to say, they definitely hit the spot. 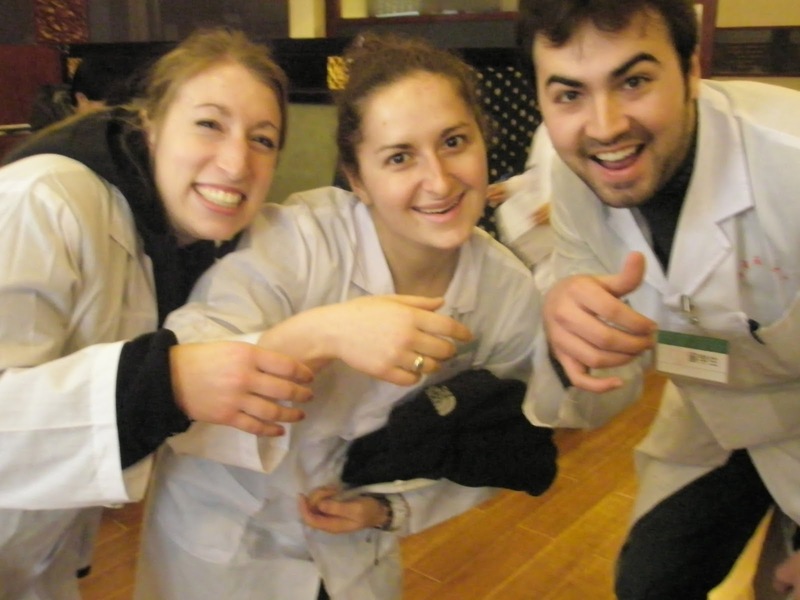 The next day, we spent the morning in clinicals, where my group was able to see each kind of TCM procedure, including acupuncture, moxibustion, herbal paste, massaging, and cupping. All of these techniques were used over the course of several different patients between the in-patient and out-patient area of the acupuncture clinic behind the hospital. It was truly incredible to see patients that suffered from paralysis and Bell's palsy being treated with these alternative treatments that are becoming more and more common throughout the world. We saw a single older patient, a man that appeared to be in his late 50's, who received several different treatments within an hour of the previous one, including moxibustion, acupuncture, herbal paste, and even vitamin injections into his face. It was actually one of my first experiences in a clinic, being able to see patients being worked with directly, since I am not truly a nursing student, which was an incredible opportunity within itself. During the last few minutes of our time in the out-patient area, we had one of the students who had been practicing acupuncture for the last few years to place a needle into each of our hands since we had never experienced it yet. The feeling was very odd, to say the least. It did not hurt piercing the skin, but it did give off a feeling that the area it was poking had swelled within my hand. After our lunch break, we returned to a new professor who discussed to us the various meridians and collaterals within the body. This was by far the most difficult lecture that we've had during our stay in Chengdu, not only for the fact that the material was much more in depth than previous lectures, but also the trouble that we were having with the interpreters trying to keep up with the professor's pace of teaching. On Wednesday, we woke up to darkness in our hotel from the power being shut off, which, we were told, was done so that they could check all the electrical wiring in the building. Whatever the case was, we arrived a few minutes late to the bus, as we were spending the day at one of the first government-funded nursing homes in Chengdu, which housed fifty senior citizens, though it could hold up to a hundred. After receiving a warm welcome, our one of our professors, Dr. Guerrero, gave a lecture on the comparisons of Eastern and Western medical care toward the elderly for the next several decades. It was nice to see information being offered to the nursing staff that may help them in the coming years as health care may change in China. After her lecture, we were able to walk around the facility and receive some first-hand accounts by the seniors on how comfortably they were living. From what it sounds like, they had a fairly well-established relationship with the workers and nurses there. They all said that they were treated very well and still had an amount of independence that they were happy to have. After this point, we were able to play table tennis in the recreational area with some of the staff and then go to get some previews of the moxibustion and foot bathing techniques that they use for the elderly people there. It felt that they were being treated very well and were enjoying their time there while receiving some well-deserved care when required. Eventually we were able to buy a few trinkets from the facility before leaving for the hotel. We still have a long trip ahead of us, and I can't wait to return home with all of these incredible stories and items of memorabilia!